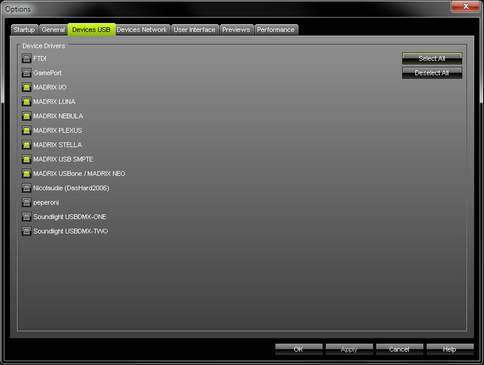 MADRIX allows to activate or deactivate drivers for various hardware interfaces, such as MADRIX NEO and others. ▪ Activate the required drivers for your hardware interfaces. MADRIX also supports a number of 3rd-party interfaces. ▪ Devices USB only activates the required drivers. ▪ Make sure to enable and configure your hardware interfaces also according to your requirements. - you can speed up the loading/starting time of MADRIX. - you can avoid problems with other interfaces. - you can avoid problems with other software running on your computer which also controls such DMX interfaces. ▪ All options of Devices USB will be saved locally on your computer. The settings described in this topic will not be saved in your MADRIX Setup file.